Wheat & Weeds: St. Lincoln the Incorruptible? 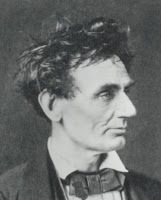 Found this link to unusual photographs of Abraham Lincoln in one of Jonah Goldberg's G-files. I guess I'll have to lay off Eldest Weed about his hair. Very cool, but what's this? Gosh. Maybe Lincoln's more worthy of admiration than I knew.